When asked about their actions in a certain situation, many people will often claim that they carefully weighed the pros and cons before cautiously making a decision. However, this is often the opposite of how behavior actually takes shape. We tend to make decisions irrationally based on how we feel (or how we anticipate we’ll feel) and then justify those decisions rationally (Damasio, 1994). Emotions dominate decision making because they motivate us to behave (i.e. avoid or approach). The stronger or more intense (i.e., arousing or stimulating) our emotional experience is, the lower our ability to consciously evaluate the pros and cons of an offer or a situation. All of this makes us easy targets for marketers and advertisers. Compliments and flattery are persuasive devices that can be used to influence decision making. A few years ago, Trevor was shopping in a department store in Sweden. While browsing in the men’s section, he came across a pair of pants that he liked and decided to try them on. 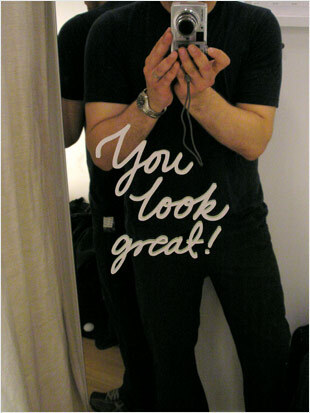 In the fitting room, he put on the pants, his back toward the mirror. Turning around to examine the fit, he was surprised to see the message in the image on the left. Flattery has long been recognized as an effective persuasion method. Even though Trevor was aware that the message was designed to persuade him to buy whatever he was trying on, it still produced an instant, unconscious emotional reaction. Part of that reaction can be attributed to sheer novelty, because he had never encountered something like this. However, the remainder of his reaction was due to a compliment offered, oddly enough, by an inanimate object. Even a compliment from an inanimate object is more affective than no compliment at all. The experience of being flattered is usually a pleasurable one, even when the compliments come from a few impersonal words written on a mirror. Tactics like this can often provide the touch of added influence that triggers a purchase decision. The more intense the emotional experience is, the lower our ability to consciously evaluate the situation. Behaviorally, pleasure is linked with the tendency to approach, and pain is linked with the tendency to avoid. When shoppers make purchase decisions, brain imaging has revealed that a choice is made between the pleasure of purchasing and owning the item and the pain of spending the money. Researchers found that they could accurately predict shoppers’ purchase decisions by noting which area of the brain was more active when they considered a purchase (Knutson, Rick, Wimmer, Prelec, & Loewenstein, 2006). We explore this in much more detail in the book. It’s not just retailers who are using emotion to influence your buying habits and purchasing decisions. 95% of pharmaceutical advertisements used an emotional appeal. Incidentally, not one mentioned lifestyle change as an alternative to their products. The ads often framed medication use in terms of losing (58%) and regaining (85%) control over some aspect of life (Frosch et al., 2007). Even the pills themselves have been “designed”, with studies linking the color of the pill to its perceived effectiveness. A survey of 12 studies found that stimulants worked better when colored red, orange, or yellow and that tranquilizers worked better when colored blue or green (de Craen, Roos, de Vries, & Kleijnen, 1996). Marketers and advertisers in a number of industries clearly understand that emotions dominate decision making. It’s time that designers and UX professionals understand this as well. Damasio, Antonio, R. (1994). Descartes’ error: Emotion, reason, and the human brain. Florida: Grosset/Putnam, Inc.
de Craen, A. J., Roos, P. J., de Vries, L. A., & Kleijnen, J. (1996). Effect of colour of drugs: Systematic review of perceived effect of drugs and of their effectiveness. BMJ, 313 (7072), 1624–1626. Knutson, B., Rick, S., Wimmer, G. E., Prelec, D., & Loewenstein, G. (2006). Neural predictors of purchases. Neuron, 53(1), 147–156. Frosch, D. L., Krueger, P. M., Hornik, R. C., Cronholm, P. F., & Barge, F. K. (2007). Creating demand for prescription drugs: A content analysis of television direct-to-consumer advertising. Annals of Family Medicine, 5(1), 6–13. It is really funny to observe how so-called “modern world” getting dumb-and-dumber day by day. At least thats what tv marketing/advertizers might think of their very own neighbors. Stupid assamption that rolling idiotic clip for Cola during Olympics will makes me buy their poison. Helloooo??? Are they completely gone? MAybe 30 years ago when Mr. Turner revolutionized ads campaign it was justified but today with all available knowledge of their screwed-up and twisted intents? Lets say someone preferred “Lee” for “Levy’s”. No matter how many times the “Levy’s” rolling their ads or how big and glamor their poster /billboards may be, that person still likes his/her “Lee’s”. More then ever, he/she starts actively hate opponents brand and spread negative comments and suggestions. No matter how the KIA rolls their ads on tv, everyone KNOWS what kind of car it is. My opinion: ad promoters/producers who still relies on some idiotic polls completely out odf scope and hanging on the old public “psyhiatric” evaluation to save their income. I do not have anyone in my surroundings who makes purchasing decision based on tv commercial. It maybe roll your interest towards to check out but all people I know do their “home work” before buying. Another thing that allow brands like Coca” and other established brands is they can lower their prices significantly. Thirdly parents have to get themselves educated and establish continios communication with their children. If I found that cola products are bad for digestive system – my kids will have it once or twice a year maybe, and not out of my pocket. Although I agree with you to a certain extent, we can not distract from the fact that the masses do follow the trends, and that tends to be thanks to advertising. No matter how savvy you or your family is, there will always be instances where you have to fight your corner, often against your own kids too. People do react to constant marketing and subliminal messaging. However, we may want to think of the flip side too, thanks to mass media there is an abundance of information readily available, to a certain extent, we just need to educate ourselves and everyone else to not just go with the flow, all the time. Enter your email to get updated about new content. PRIVACY: We'll never share your information. Design for Emotion is a guide to understanding and applying emotion and personality in design. © 2019 Affective Design Inc.